Various Tin Machine formats from their brief career! Top, from left: "Baby Universal" and "You Belong In Rock N Roll" twelve inch singles, and the seven inches of "Under The God" and "You Belong...". Middle row, from left: Twelve inches of "Prisoner of Love" and "Under The God" and live bootleg album "Live Machination". 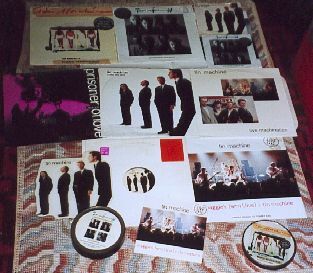 Bottom, from left: "Maggie's Farm" shaped picture disc, "Under The God" promo twelve inch and "Maggie's Farm" foldout poster sleeve twelve inch single.